You can’t eat the orange and throw the peel away - a man is not a piece of fruit! Death of a salesman is often considered Arthur Miller's finest achievement and, a piece inspired so very heavily by experience of the issues of his own family, it stands as a work of incisive realism. When Gregory Doran chose to commemorate Miller's centenary in the new RSC season, he could hardly have chosen a more appropriately personal work. An actor recently said that there is an age at which one should play Lear, and I’d be inclined to suggest that the same could be said of the character of Willy Loman. Antony Sher appears to be at that age. He has announced his forthcoming appearance as Lear in 2016, also under Gregory Doran’s direction, and in juxtaposing it with his performance as Loman in this production he and Doran assert the significance and stature of Miller’s work. Arthur Miller is famously explicit in his stage directions and, while some productions kick against this, Gregory Doran and his designer Stephen Brimson Lewis have remained faithful to the author. What is on the page comes vividly to life in their multi-level set, on which past and present can coexist and blend seamlessly from scene to scene. Antony Sher exudes world-weariness from every pore in the opening scenes, drawling out the lines as though every word were an effort and when stepping back to earlier times, sparring with his sons, we see the toll that time and circumstance have taken on him. Harriet Walter is spectacular as his long-suffering wife Linda, the burden of watching the disintegration and shame of the love of her life almost visible in her carriage, and palpable in every line. 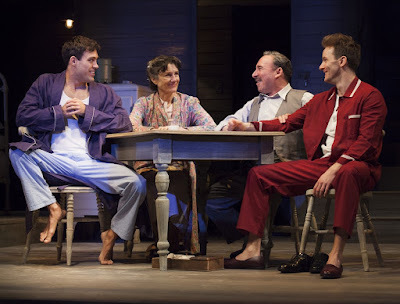 Alex Hassell and Sam Marks give strong performances as brothers Biff and Happy, as do Joshua Richards and Guy Paul as Charley and the spectral Uncle Ben. Gregory Doran’s thoughtful and well paced production seems to focus on Miller's idea that the play has “more pity and less judgement”, and it leaves us feeling for Willy Loman in his desperate search for where everything went wrong. Death of a Salesman has a performance time of 2½ hours including one interval and it continues at the Noel Coward Theatre until 18th July.